The most prominent expresses of South Africa and Rhodesia connected at Cape Town with the Union Castle Liners to and from England. 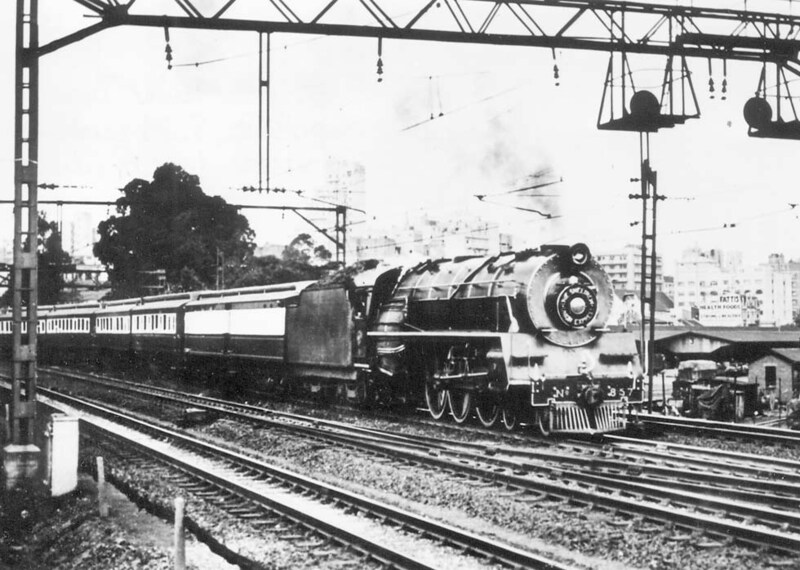 In the 19th century, trains from Cape Town to Port Elizabeth ran in connection with the steamers. 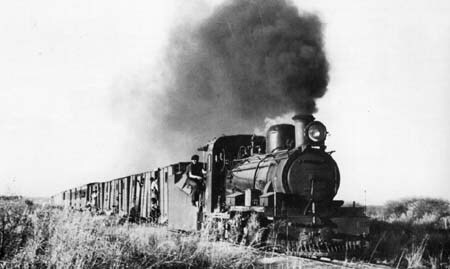 A de-Luxe from Cape Town to Bulawayo, Rhodesia, started in 1902 via the Cape Government Railway and the Rhodesia Railway. 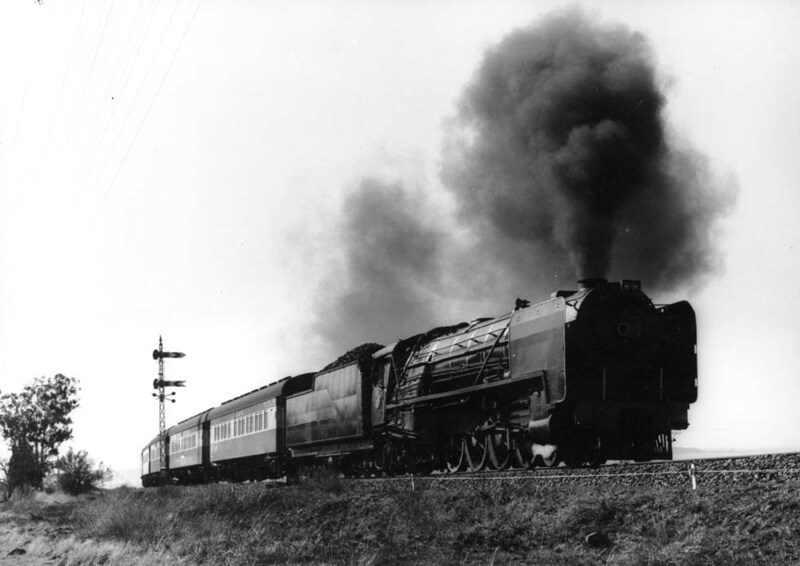 It was known also as the Cape Mail or Rhodesia Express. From 1905 a Zambesi Express Mafeling - Victoria Falls is reported, connecting with the Mail from Cape Town. General note: Upper classes of RR, SAR and CFM generally sleeping compartments. NRZ: from 1980, heritage, then also new General Electric diesels, yellow. Electrification started at Harare. Botswana Railways: In the '80s service was taken over from NRZ, diesels class 33 leased from SAR, new blue diesels from Krupp and GM. SAR/SATS/Spoornet: compare Union Limited, also Mountains class 19D (and "Irene", rebuilt by Dave Wardale), diesel General Electric. 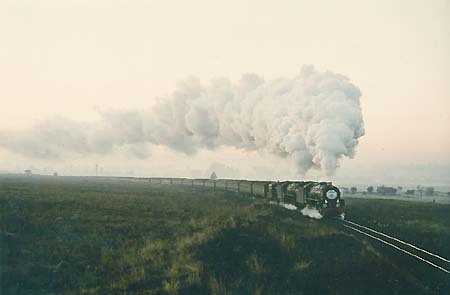 Colors: steam locomotives generally black, diesels and electrics maroon, Spoornet orange. Traction: Bulawayo - Mafeking 15A (Garratt), by RR, Mafeking - Warrenton 19D (4-8-2), Warrenton - Kimberley 5E1 (3kVdc) Kimberley - Beaufort West 25 (4-8-4), Beaufort West - Cape Town 5E1, by SAR. Colors: Steam locomotives black, RR cars brown/cream, SAR cars red/light grey. Transvaal, ruled by Paul Kruger, preferred an independent line to the harbor Lourenco Marques in Mozambique. In 1895 the NZASM completed it. From 1896 also the link with the Cape Government Railway was established. Kruger was defeated by Cecil Rhodes and in 1903 Pretoria got an Express-de-Luxe to Cape Town via the CSAR, hauled by class 10 Pacifics. 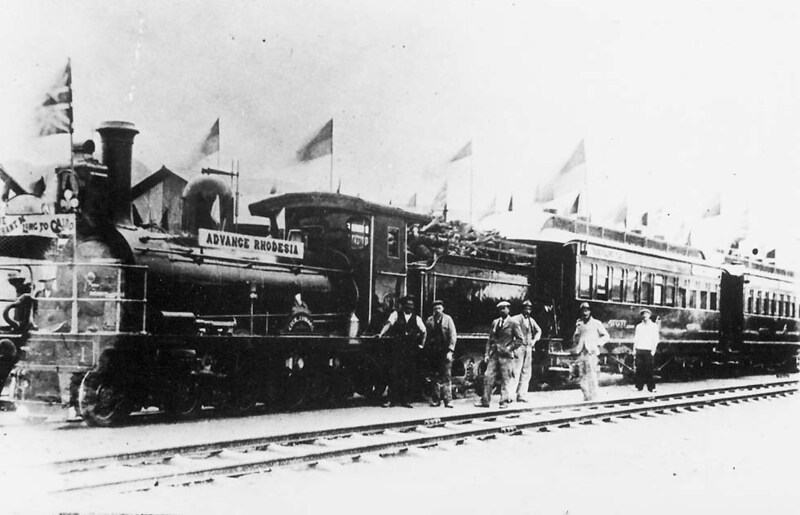 In 1910 the Union of South Africa was founded and with it the South African Railways (SAR). 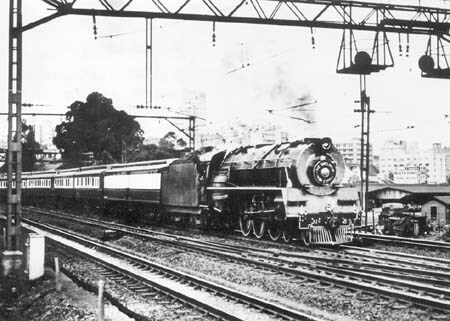 In the '20s the de-Luxe Johannesburg - Cape Town in connection with the Union Castle steamers became known as the Union Limited. The mahogany cars of the ex-CSAR train were used and then new ones, including twin-diners, painted blue/cream. All-sleeper de-Luxe, cars from 1939/40, colors blue/cream. Service interrupted 1942-46, then known as the Blue Train, in 1972 replaced by new Blue Train, Pretoria - Johannesburg - Cape Town, light-blue, white line. 1953-1972: 3E, 5E, 5E1; north of De Aar 25NC, south of de Aar 25 (4-8-4); near Cape Town 4E, 5E1. From 1972: two 6E1, Kimberley - Beaufort West two 33-400, 34-000 (diesel CoCo, GE), to Cape Town three 5E1, all locomotives blue. After introduction of the new Blue Train in 1972, the old cars were painted light-green and for some time they formed the De-Luxe Drakensberg Johannesburg - Durban - Cape Town, hauled by class 25 and other ones. Pretoria - Johannesburg - Cape Town by Spoornet, all classes, also Premier Class sleeper, twin-diner and enclosed motorcar transporters, blue with fancy colors. Traction: Two 6E1 (dc), at Pretoria replaced by two class 15CA (4-8-2), on CFM (Caminhos de Ferro do Mocambique) General Electric (U20C type). Colors: 6E1 blue, steam locomotives black, CFM diesels red, SAR cars red/light-grey, CFM cars dark-red (on the Bulawayo - Maputo train there were also stainless CFM cars). 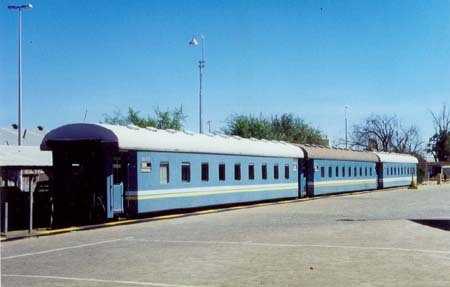 From the '80s the Johannesburg train was confined to Johannesburg - Komatipoort, with connection to Maputo. Deutsch Suedwest-Afrika, recognized in 1884 as a German colony, got in 1902 a 0.60m-narrow gauge link between Swakopmund, the ocean steamers’ port-of-call, and the capital Windhoek. The Robert Williams Group, trying to realize Cecil Rhodes’ dream of a Cape-to-Cairo railway, considered a connection with Angola, but only the narrow-gauge Otavi railway was built within the German colony. Also an anticipated link with Rhodesia was never realized. In 1912 however a Cape gauge line from Luederitz, the port in the south, to Windhoek was completed. With World War I Germany lost the colony, which became connected with the South African Cape gauge network. 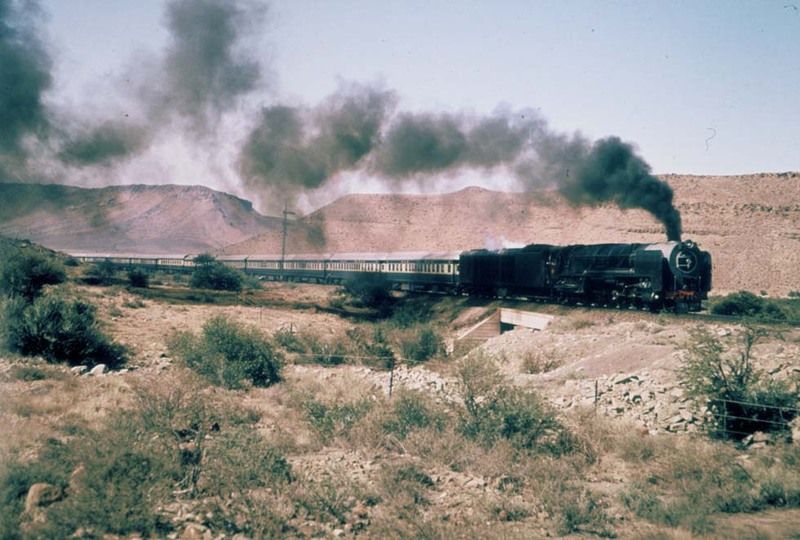 An express train Cape Town – Keetmanshoop – Windhoek – Swakopmund – Walvis Baai was started and the Otavi line was converted to Cape gauge. 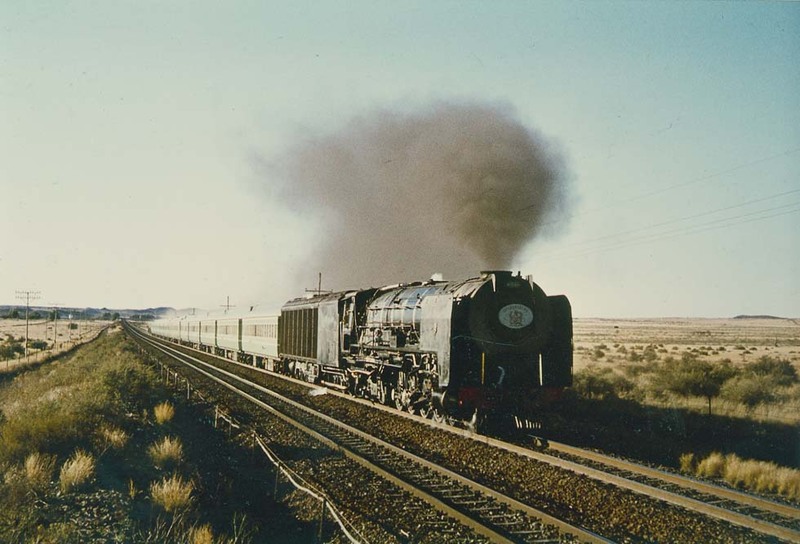 In the late 80s the express “Suidwester” from Pretoria and Cape Town to Windhoek was stopped. Now, liberated Namibia has no longer any regular passenger train service to South Africa, but in the first years of our century refurbished sleeping-cars were introduced on the Windhoek – Keetmanshoop route under the label Starline Passenger Services.